Get $30 credit for each friend you refer! Love the concept of GrabHitch? why not get your friends to Hitch too? Get $30 for every successful referral! Refer 3 and you get $90 – more than enough to pump 1 week’s worth of petrol! You will get $30* directly to your driver wallet after your friend completes ONE ride as a GrabHitch Driver. Do remind your friend to do ONE ride by 31st May 2018*! For more information about April’s DRD, please click here. For enquiries on our DRD scheme, or if you have additional feedback on GrabHitch, please email us at : support.sg@grab.com with the Subject: GrabHitch DRD (GrabHitch$30) and we will get back to you in 1-3 working days. Alternatively, do text us at 8429 9032 (Monday – Friday, 10am – 6pm) for assistance. The $30 credit for referrer for referred scheme runs from 1st May 2018 @ 00:00 hours – 31st May 2018 @ 12:00 hours. You will only receive $30 credit in your GrabHitch driver wallet and the GrabHitch Green Packets after your friend has successfully completed ONE GrabHitch ride as a driver before the incentive period has ended. After your friend has completed his/her ride as a driver, please allow up to 10 working days after the incentive period has ended (i.e. post-31st May) for your credits to be processed into your GrabHitch driver wallet, and for us to mail the Green Packets to you. Each Driver will only be entitled to ONE pack of Green Packets regardless of number of successful referrals made in May. Drivers will only be sent the pack of Green Packets if he/she opts in via this form. 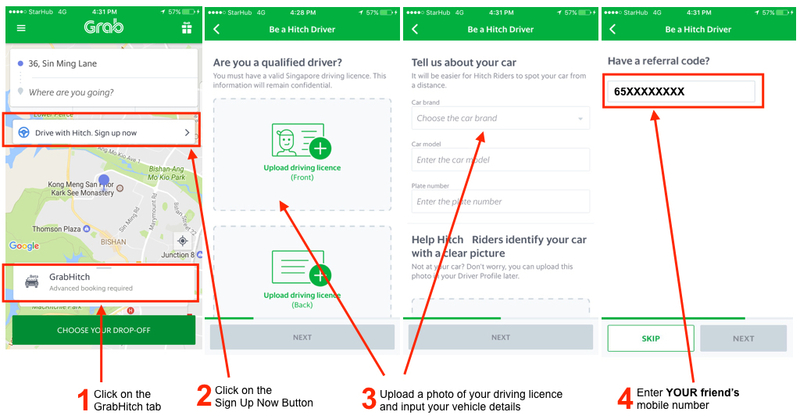 The Driver Referral program is only eligible for drivers who have never sign up as a GrabHitch Driver. You have to apply with a valid Hitch driver’s mobile number (65 plus his/her 8-digit mobile number) and do ONE successful GrabHitch ride as a driver by 31st May 12:00 hours to count as a successful referral for your friend.